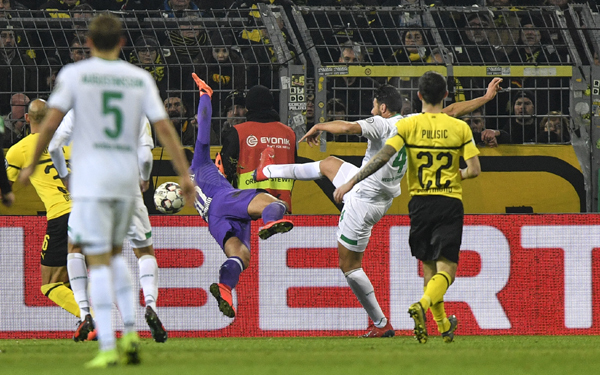 Bremen\'s Claudio Pizarro scores his side\'s second goal against Dortmund goalkeeper Eric Oelschlaegel in overtime during the German soccer cup, DFB Pokal, match between Borussia Dortmund and Werder Bremen in Dortmund, Germany onTuesday. Werder Bremen goalkeeper Jiri Pavlenka saved two penalties to knock Borussia Dortmund out of the German Cup after his team twice came from behind in extra time of their third-round match on Tuesday. Dortmund captain Marco Reus replied with a free kick in first-half injury time, but it looked like Oelschlaegel - who was only playing due to an illness affecting Roman Buerki and backup goalkeeper Marwin Hitz - would have a decisive role after making two sensational saves to keep the visitors at bay.